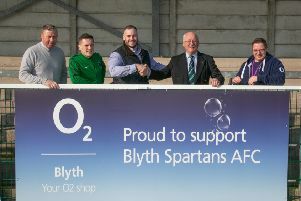 Blyth entertained local rivals Ashington Colliers looking to do a league double after a 1-0 victory earlier on in the season. Blyth, starting life after top scorer Morien joined Jarrow Roofing, were hit with a player crisis two hours before kick-off. First keeper Earle’s girlfriend went into labour, defensive lynchpin Miller was taken ill, quickly followed with Robinson unable to play due to an ankle injury, and Teddy was unable to take part due to a knee injury. Then in the warm-up, captain Iverson and striker Howes broke down leaving Blyth down to 14 with two of them being 18-year-olds from the reserves. Blyth started brightly with Mann kicking himself having missed a one-on-one chance and this was the story for 38 minutes but a corner from Ritchie was bundled in at the back post by Stanley. 1-0 at half-time. Blyth again created chances but it took to the 58th minute for Connor to out-pace the back four before sliding the ball past the out-rushing keeper. Connor wasn’t finished there a superb ball by Pockington set Connor away again this time he smashed the ball in off the post from 18 yards to cap a man of the match performance. Blyth created again with lisle going close in the closing moments.